Peter Ames Carlin’s “Bruce” is – in a word – perfect. Carlin has set out to make the definitive Springsteen biography and he’s accomplished just that. It’s hard to imagine a more complete, more thoughtful, more entertaining account of The Boss’ backstory. 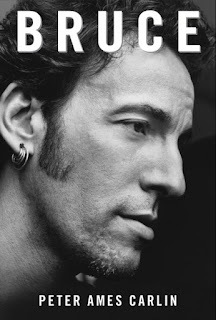 Combining comprehensive historical detail with sober objectivity and engaging musical analysis, “Bruce” is a must-own. Starting out with Bruce’s grandparents and moving along right up to the first leg of this year’s Wrecking Ball tour, Carlin’s book benefits from unrestrained access to 60+ years of Springsteen history. For those who have read Dave Marsh’s iconic books (“Born to Run” and “Glory Days”) many sections in “Bruce” will ring familiar (including my favorite anecdote of Bruce befriending a Denver teenager during a screening of Woody Allen’s Stardust Memories). But Ames is such a naturally engaging and ethical historian that he adds an additional layer of analysis that makes you pleased to reread these sections. The book’s defining quality – and what distinguishes it most from Marsh’s landmark works – is Carlin’s resistance to romanticize or deify his subject. Don’t get me wrong though, this is still a book about Springsteen so it’s laudatory overall and dutifully worshipful in the right places. But it isn’t afraid to present Bruce as human and vulnerable either. On several occasions, Carlin makes reference to Bruce’s narcissism and mood swings. He doesn’t shy away from Bruce’s darker moments either. That being said, there aren’t any real skeletons on display here: one of Bruce’s more egregious offenses involves angrily chucking a slab of chicken cordon bleu at his road manager when he didn’t get the fried chicken he requested. Carlin isn’t afraid to contradict Bruce or identify hypocrisy and inconsistency either. At one point early on, he adds a footnote that uses history to question the accuracy of Bruce’s memory about watching The Beatles on TV. A seemingly inconsequential distinction but the footnote establishes from the onset that Carlin’s work is interested in the truth, not the fantasy behind the Springsteen legend. Is “Bruce” too Bruce for a casual fan? Perhaps. But Carlin also traces the rock 'n' roll saga in striking detail in its own right. The early chapters convey the excitement, uncertainty and naivety of being in a band. The devil-may-care, anything-to-make-it sensibility in these early sections is infectious. But it also illustrates the relentless drive that Bruce possessed and in equal turns illustrates both the gift and curse associated with his passion to make it as a musician. From there we get the highs of initial success, the cold realities of the business, the challenge of sustaining a career and finally, the triumph of making it to the top and truly owning your musical identity. It’s a trajectory that will sound familiar to anyone who has read a “rags to riches” tale before (fictional or historical) but it’s infused with the unique, transcendent quality that Springsteen invokes to so many people. At over 450 pages, “Bruce” manages to be expansive but not longwinded; concise but not streamlined. The work is punctuated by the beat-by-beat, lyric-by-lyric analysis of each of Bruce’s albums that diehards will read with vested interest and will be equally ready to agree or argue with Carlin’s thoughtful critiques. Released in time for the holidays, every Springsteen fan should be so lucky to find this wrapped up in a bow.